Although there is no scientific evidence that flatulence equates to feeling better, there are a variety of legitimate reasons to eat beans with every meal. For one, they actually are good for your heart, and another is that not all of them have to necessarily make you fart. Beans and legumes are among some of the most nutritious plant-based foods available. They are usually very high in protein, making them an excellent alternative protein source for those trying to cut down on meat. They are also full of beneficial minerals and dietary fiber, making a lot of them great for aiding in digestion. Beans also stay true to the songs that are made about them, as they have been shown to benefit heart health significantly. Many researchers believe that eating beans regularly helps lower blood cholesterol, which is a leading cause of heart disease. Although there are many proven health benefits of beans, many people tend to avoid them due to their gassy side-effects. Here is a list of some of the most popular beans out there, ranked from gassiest to least gassy, so if you want some suggestions for beans that won’t cause flatulence, look for the varieties mentioned at the bottom of the list. Soybeans are well known to be the most flatulence-inducing legumes out there (I’m sure many vegetarians can verify this), along with most other soy products. Studies have found that even infants given soy products experience an increase in flatulence and methane production, and also have an increased amount of sulfur in their flatulence, which is what gives it that distinctive scent. Kidney beans and chickpeas are also high up on the gas-causing bean list as they generally considered somewhat difficult to digest, despite being some of the most nutritious beans available. Both pinto and navy beans are also top offenders when it comes to most gas-inducing beans. A study conducted on the effects of beans on human flatulence found that slightly less than 50% of people who ate either pinto or navy beans reported an increase in the amount of gas that they passed afterwards. This means that if you decide to go with pinto or navy, you’re taking a 50/50 chance on passing gas at the dinner table. Black eyed peas come in below pinto and navy beans with only 19% of people who ate them having an increase in flatulence. Although the type of beans you choose to eat do play a role in how gassy they will make you, there is more you can do to reduce their flatulent properties then just avoid them. The secret is in the preparation. Beans contain a type of resistant starch called oroligosaccharides. These are carbohydrates that cannot be digested solely by the enzymes in the gut, so instead your body breaks them down through a process called bacterial fermentation. This fermentation occurs in the intestines and often results in the passing of gas that is accurately attributed to the beans you just ate. So, in order to be able to enjoy beans without the gassy side effects, you have to remove these oroligosaccharides before eating this. According to a study conducted in the Netherlands, you can do this by changing the type of water that you cook your beans in. Researchers found that cooking beans in an alkaline solution significantly increased the amount of oroligosaccharides that were removed from them, proving to be more efficient at this task than the method of soaking beans before cooking. For this alkaline solution, you can either buy alkaline water or make your own by mixing baking soda into water. To make this alkaline water, simply mix 1/8th of a tablespoon of baking soda with 1 cup of water. 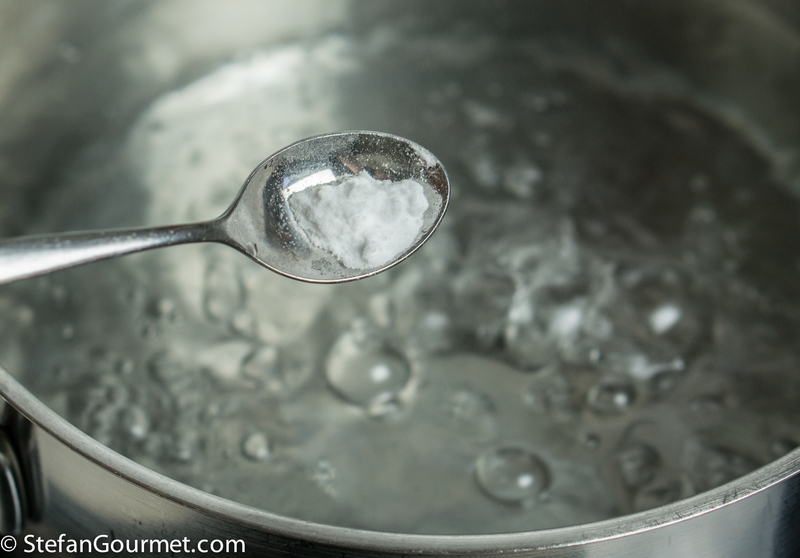 Make sure to mix thoroughly to ensure that the baking soda is completely mixed in with the water. 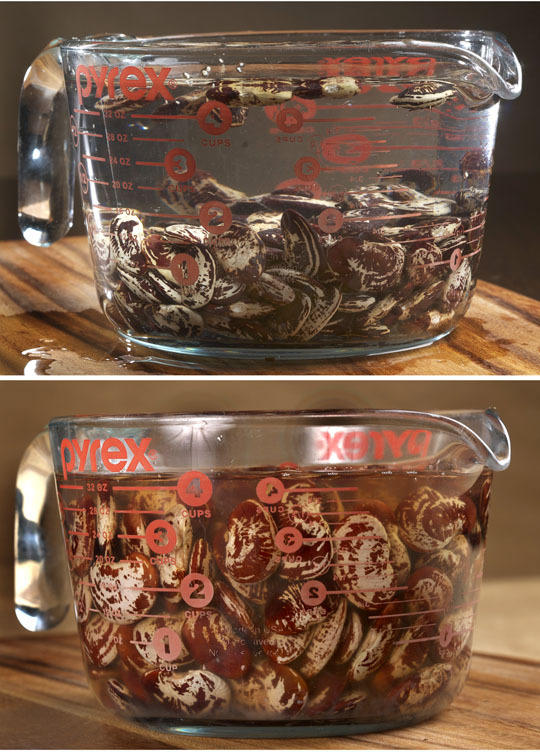 Use this as you would use regular water to cook your beans and you should find that you will have a less gassy aftermath.